Jeffers Mound Artifacts from the collections of the Worthington Historical Society (WHS) may be used for educational purposes as long as it is not altered in any way and proper credit is given: "Courtesy of the Worthington Historical Society, Worthington, OH." Prior written permission of the WHS is required for any other use of Jeffers Mound Artifacts. Contact WHS at info@worthingtonhistory.org to request permission. Jeffers Mound Artifacts is realia. It was created sometime around 100 BC - 400 BC. 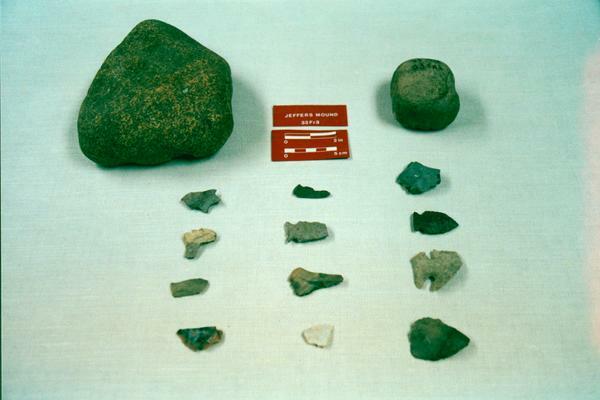 These artifacts were uncovered during excavation of the Jeffers Hopewell Prehistoric Mound in 1985 by the Ohio State University Field School in Archaeology. Pictured here are two ground stone artifacts, five projectile points and seven other chipped stone artifacts. Dr. Richard Yerkes, Department of Anthropology, The Ohio State University and his students looked for evidence of domestic activities and/or crafts workshops at the site. If domestic "middens"-prehistoric trash heaps-and other signs of everyday life were found, they would suggest that the Hopewell used the site as a long-term settlement. The team found a few projectile points and other artifacts, but not the confirmation they needed to suggest the site was occupied for long periods of time. The land surrounding and including the area where the mound is located was part of the original Scioto Company land purchase. Itwas divided into farm lots for Scioto Company subscriber, William Vining. The mound and land immediately surrounding it was donated to the Worthington Historical Society in 1974 and the site was nominated to the National Register of Historic Places. It covers the topics Native Americans and Jeffers Hopewell Prehistoric Mound. The Worthington Memory identification code is whs0026. This metadata record was human prepared by Worthington Libraries on November 13, 2001. It was last updated October 24, 2017. Although written history of the city of Worthington began in 1803, the history of people in central Ohio extends for thousands of years before that. The results for the fall 2004 My Worthington Memory Makers Contest are in! Congratulations to the following students in Mrs. Riggs' and Mrs.
Indian Bill Seriously Ill At County Infirmary.